2,689 to 3,565 Sq. Ft.
Candela at Rancho Tesoro is a gated community of new two-story detached single family homes. A downstairs bedroom and the option for a second master bedroom downstairs will be available. 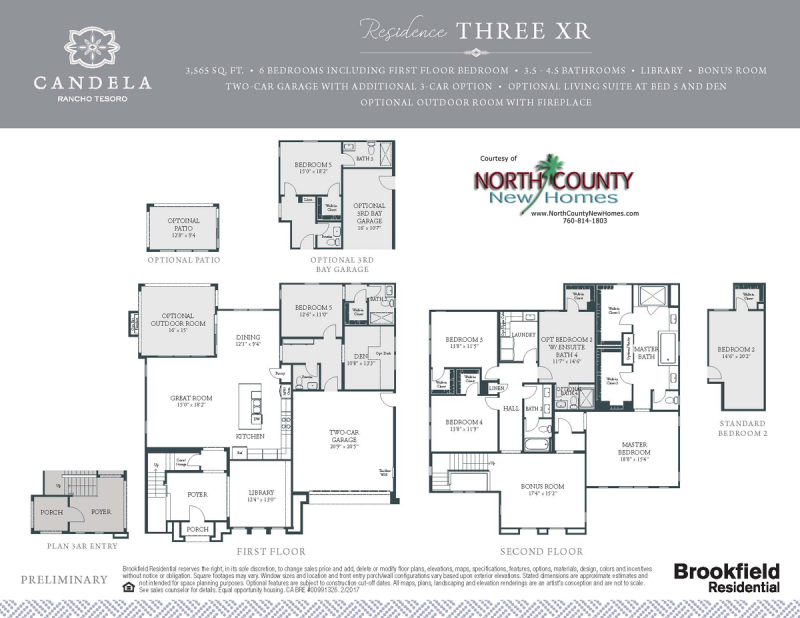 These new homes in San Marcos will range from 2,689 to 3,565 square feet and include 4 to 6 bedrooms with 3 to 4½ bathrooms. All homes include a 2-car garage. 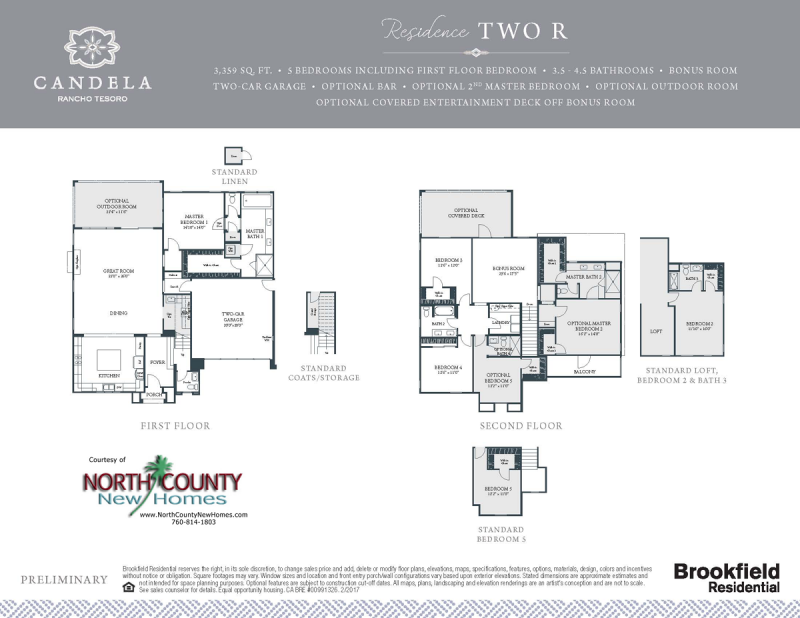 Candela will feature 3 floor plans, all with upstairs laundry rooms, bonus rooms, kitchen islands and walk-in pantries. Plan 2 includes a master bedroom downstairs. Plan 3 offers an option for a third bay garage. 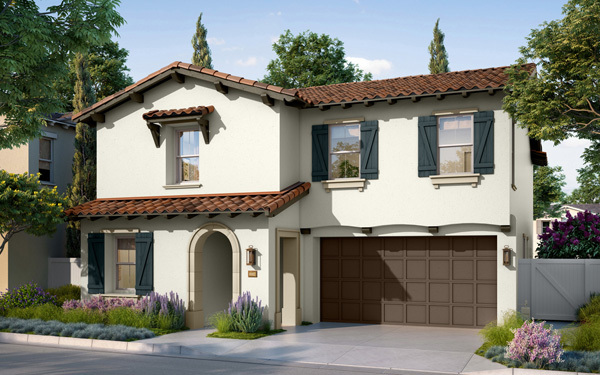 Rancho Tesoro features 4 new home communities in San Marcos, CA. The new master planned community will consist of 346 new detached single family homes. All homes in Rancho Tesoro will be 2-story homes ranging from 2,211 to 3,565 square feet with 3 to 6 bedrooms and 2½ to 4½ bathrooms. Several of the new communities will have gated entrances. 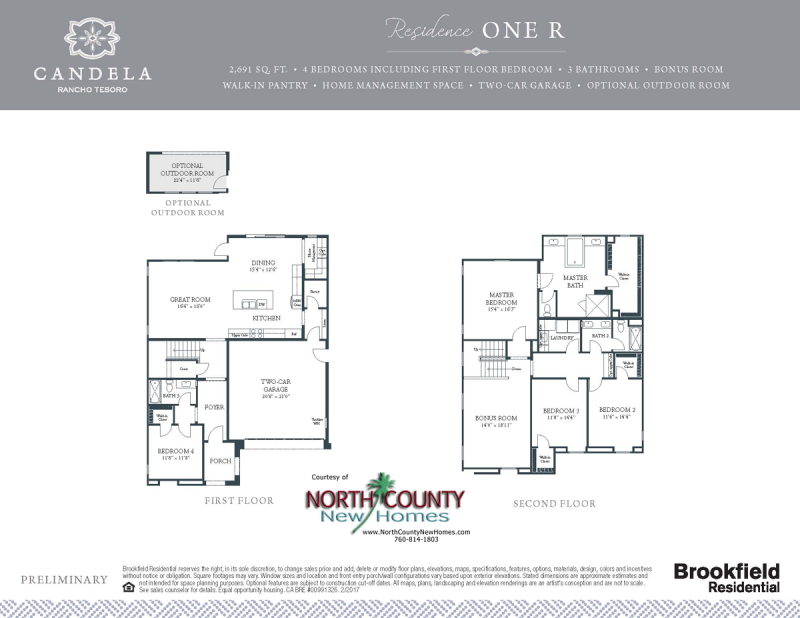 The Rancho Tesoro master planned community is nearby Cal State San Marcos, is adjacent to Twin Oaks Valley Road and just a short drive to Highway 78. Shopping, dining and entertainment is abundant in San Marcos. The location also offers convenient access to adjacent open space and miles of hiking trails. Inside the new master planned community will be walking trails, parks and recreation areas. The Cabana, a community center planned for the neighborhood will include a swimming pool, a tot lot, a BBQ pavilion and picnic areas. Students will be able to attend the highly-rated San Marcos Unified School District. $164 per month HOA fee plus $45 per month for community fee. Effective tax rate with CFDs is approximately 1.6% of the purchase price.